If you haven't been on Listia lately, most of the sellers are still crazy, as are most of the buyers too. Also, inflation really hit the site hard. It used to be about 300 credits equals a buck. Now, a buck translates to almost 4100 credits. The economy took quite a hit. Next I plan to fire all the web traffic controllers. That being said, I still buy there when I can. I have even taken to listing stuff that I don't want to bother with on Ebay. It's so much better to list an item, that might go for a buck on the 'bay, and ship it in a PWE. You deal with the risks on Listia. Though, I do my best to put it in a hard card holder and tape the top with painter's tape. I have a couple recent big purchases on the site. In doing the math, based on the current price if you bought credits, these two deals totaled just under $2.50 together. Let's see if I did well. This is no ordinary '69 Topps as it's not a Topps at all. 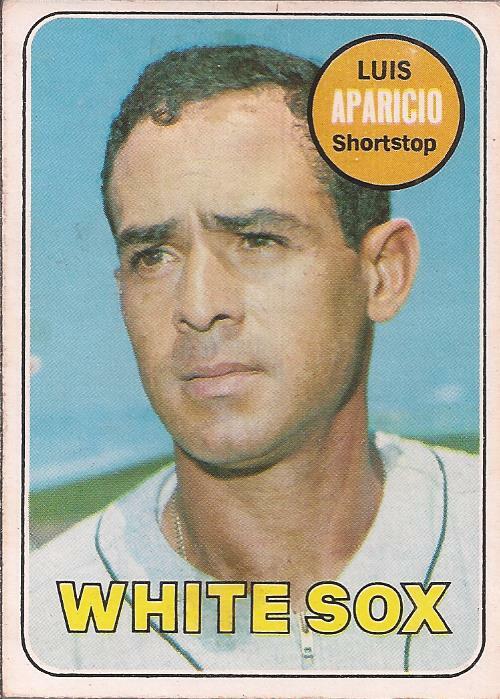 It happens to be the OPC version of Aparicio's 1969 release. It has great corners. 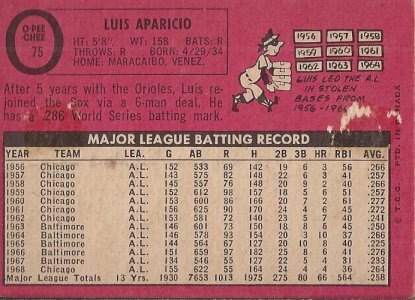 You can see the bit of paper loss and there is a crease that runs down the front right next the Luis' left eye, but otherwise I think it's a great pick up for 5605 credits, or about $1.37 shipped. I think the opening bid scared people away from this group of three. Not me, though - three GORGEOUS miscuts as these make fine additions to the miscut binders. Can't say much for the career of Mickey Scott., but who would pass up adding a Barry Bonds and a Reggie card? I was the only bidder at 4567 credits, or $1.12 shipped. What? 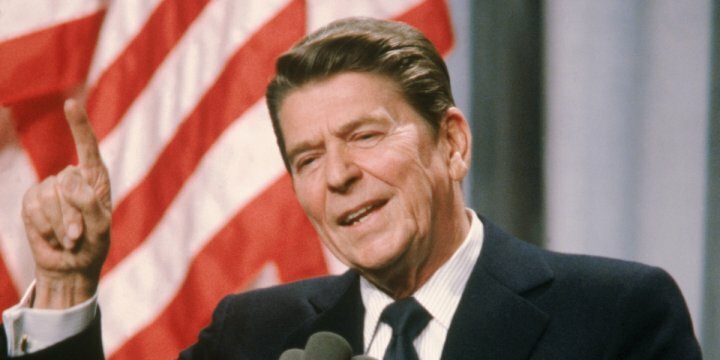 You mean trickle down economics doesn't work on Listia either?!?! I have pretty much forgotten Listia exists. Oh, how I wish for the days when I had time for its nonsense. I've still not made the Listia plunge. Damn. Wish I would have spent my Listia credits last year. That Aparicio is awesome! Love the bright pink back. I haven't done much with Listia lately either...I ended up selling a bunch of stuff right before inflation took off...and then I got virtually zero on my dollar return. It soured me to the point that I haven't bothered selling anything more to get more credits.